By popular request we smoothed out some rough spots in our recent Shock Force 2 release. With this patch (click here) there's significant improvements to Marine and Canadian uniforms, a few mismatched weapons cleared up, issues with the Marines Campaign fixed, and another dozen useful improvements. At long last the reworking of a masterpiece in wargaming is complete and ready for you to play! After a brief "soft lauch" mode earlier this week we are very pleased to officially announce the release of Shock Force 2 for both Windows and MacOS. You can now purchase the Base Game and Modules in various combinations to suit your tastes and budget. For orignal CMSF1 players there are a bunch of inexpensive options awaiting you in the Upgrades section. If you preordered CMSF2 your license key and download link now work. For existing CMSF1 customers your old license keys are in the system and ready to be reactivated. Even if you've misplaced your license key or have a retail version, we'll help you out. Check out the CMSF2 Forum for more information. 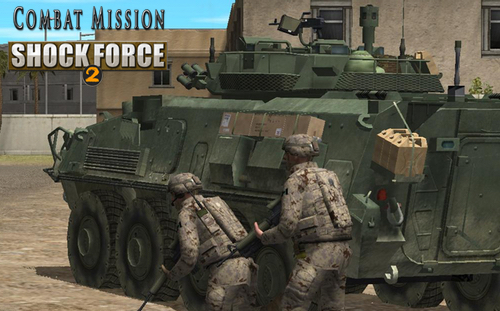 The journey to bring Combat Mission Shock Force 2 up to current Game Engine 4 is nearly is at an end! We are pleased to announce preorders for CMSF2 Base Game and Bundles are now available. And for those who don't know, all CMSF1 (original) products can be inexpensively upgraded once CMSF2 is released. How inexpensive? $35 for everything or less if you only have one or two things in need of an Upgrade. The obvious question out there is "when will CMSF2 ship?" We're aiming for no later than the end of September. However, we'll soon release a demo with 4 battles and a training mission. That should help keep you occupied for a while. New Store, Same Accounts. VERY IMPORTANT!!!! PLEASE READ!!!!! If you can not remember your login info, or are using an account with a dead email address, click on the Support link above and then the Help Desk to file a ticket. Please be patient for a response. We now offer more purchase options for most products. As before all games include free, unlimited downloading for both Windows and MacOS. Due to the ever increasing costs of printing and shipping, you can now select between Digital Only, Disk Only, Manual Only, or Manual and Disk. Because we only print Game Engine manuals the new option allows you to order a manual ONCE and still order DVDs for future purchases. This way you don't have to pay for redundant printed manuals just to get DVDs. If you should find a technical issue with the website in general or the store specifically, head on over to the general Tech Support Forum and let us know. What happened to Shock Force? Shock Force 1 is no longer available for sale and therefore you will find no trace of it on this website. What you will SOON find is Shock Force 2! Everything is set to go for preorders, however we wanted to first take the website and store for a shakedown cruise before there's a bunch of you Refresh Monkeys™ hammering away on the new site. And for those who don't understand the monkey reference, ask around on the Forums and you'll quickly find out. But be prepared for long winded tall tales from the old timers. Sometimes it's better not to ask! © 2019 Battlefront. All rights reserved.